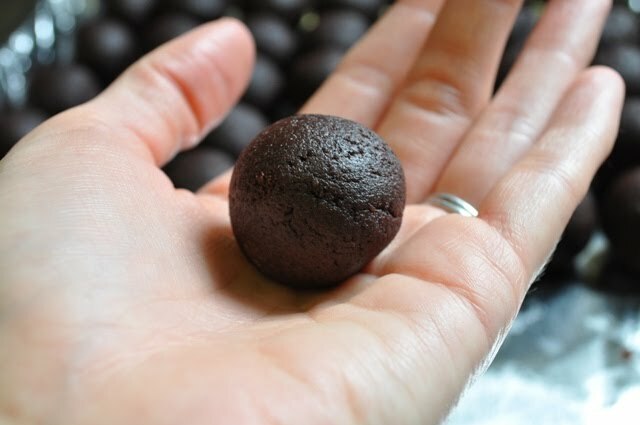 Have you had a cake truffle before? Yes? No? No???? Oh my God! You have to make these now just so you can have one. Or 10. Well maybe not 10 at once. My friend did a rough calculation and estimates these little babies to be at least 100 calories each. I haven't checked her math, but WOW! And yes, they are that good. But if you eat 10 you might go into sugar shock. So just eat 1 or 2. Then give the rest away to your friends and family and they will express their undying love to you forever and ever. 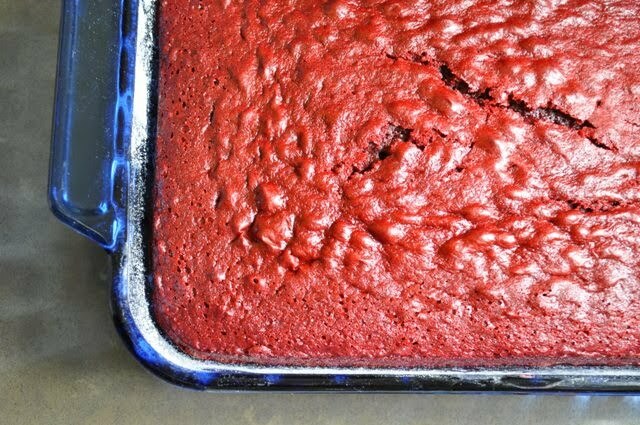 of red velvet cake mix and baked according to the instructions. Finely crumble cake with your hands. 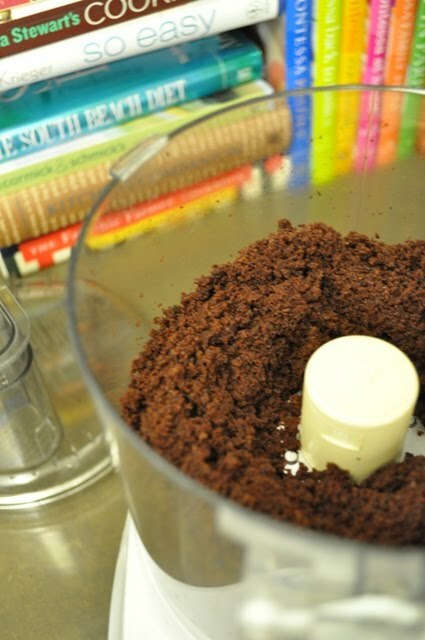 Or for a much much faster approach, use a food processor. 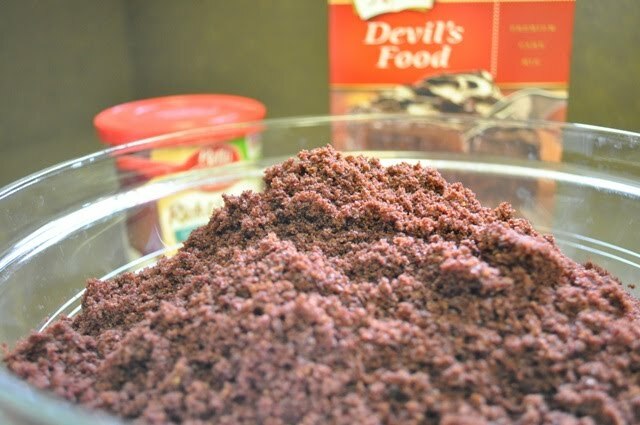 (I didn't take as many photos of the red velvet process so now we're switching over to chocolate.) 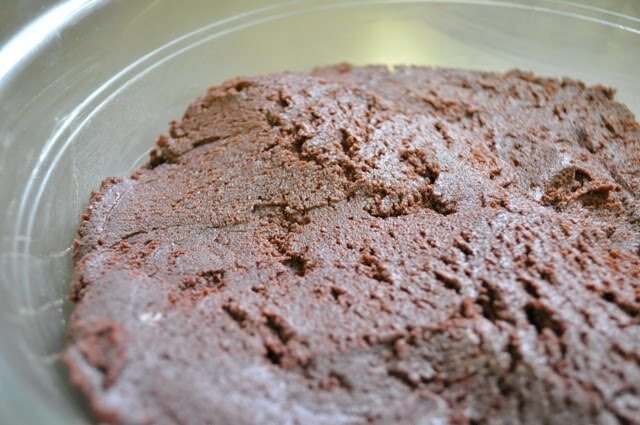 Just place hunks of the baked and cooled cake into the food processor in batches. 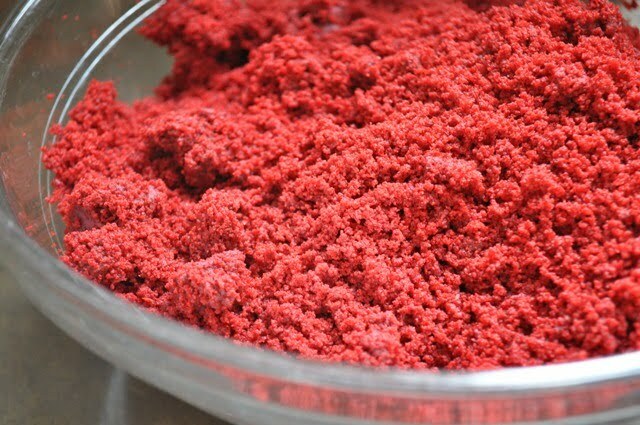 Once the first batch is crumbled, dump it into a big bowl and then repeat until your whole cake is finely crumbled. Then grab your canister of store bought frosting, such as cream cheese....yes, store bought. Or you can make your own. 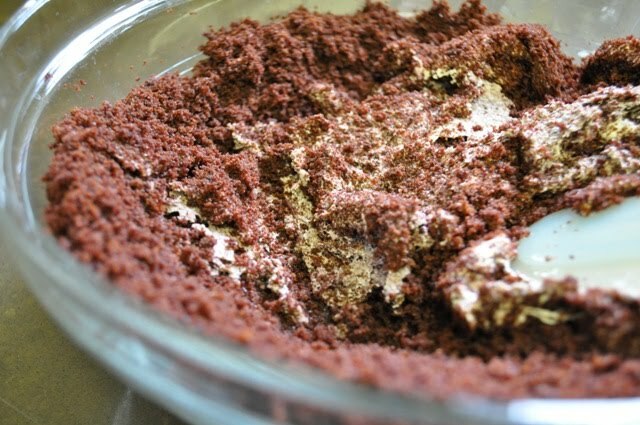 Anyway, spoon about 2/3 of the container of frosting into your big bowl of cake crumble. And work it into the cake. I like to use a rubber spatula. 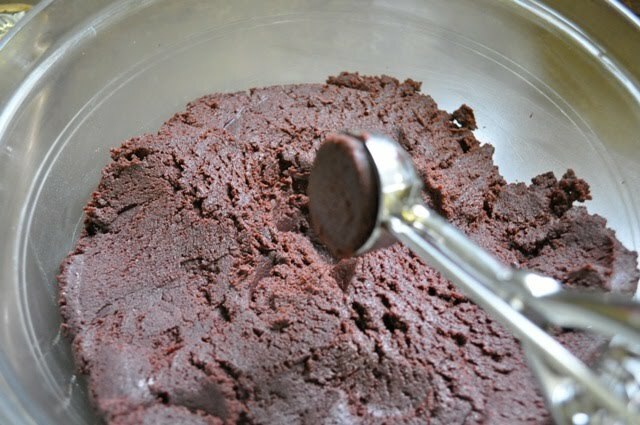 Until it all disappears and you have a fudgy dough like consistency. 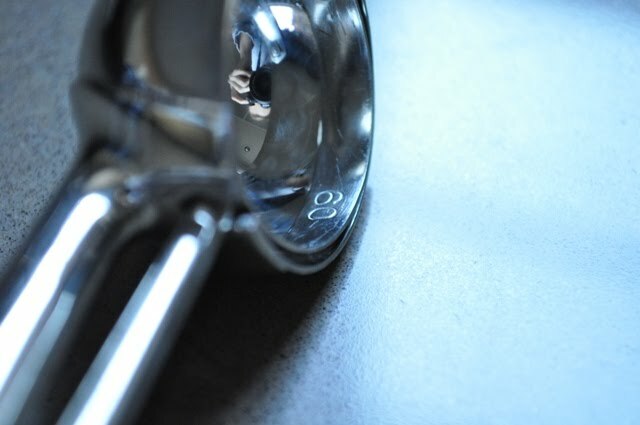 Get out your medium sized cookie scoop (I use a number 60--the number can be seen on the swipy thingy that ejects the dough from the scoop) and scoop away. 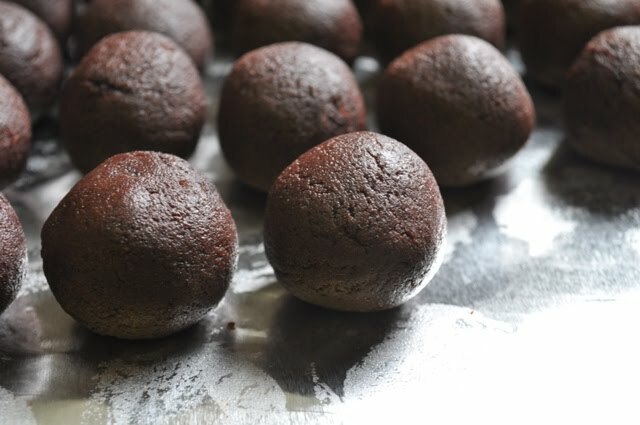 Place your cake balls onto a tin foil or parchment lined cookie sheet. Make sure to use a cookie sheet that will fit into your freezer (I use a jelly roll sized sheet and it's a perfect fit for my side by side fridge/freezer). Once all your balls are scooped out, place a ball in your impeccably clean hand. And roll it around between both hands until it forms a solid smooth ball like this one. Place the balls back on your cookie sheet and freeze for 1 hour. 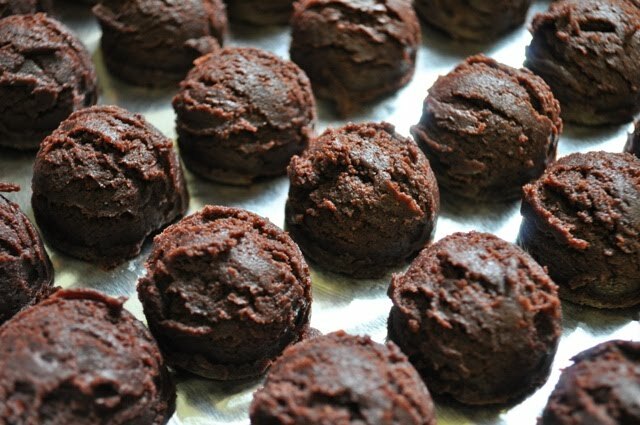 The freezing helps the balls to hold better shape when you dip them in the chocolate. 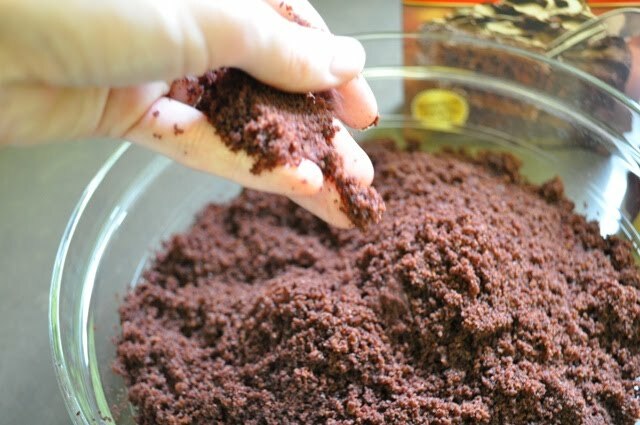 By the way, one box of cake mix makes about 60 truffles. Here's where I skipped a few photos. Now it's time to melt the chocolate. Place about a half inch to inch of water in a small to medium sauce pan. Meanwhile, place the melting candies (dark cocoa is my preference) in a medium to large deep bowl. 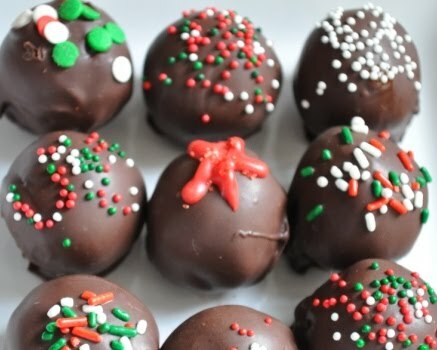 1 and 1/2 bags of candy is usually enough to coat 1 batch of cake balls. Once the water is simmering, turn heat to low and place the bowl on top of the pot of simmering water. Stir occasionally until the candies melt into a smooth, silky, consistency. Don't let too much steam build up on the outside of your bowl. If this happens turn your water down (or use a deeper bowl). Water and melted chocolate don't mix well and any extra moisture can cause your chocolate to seize. 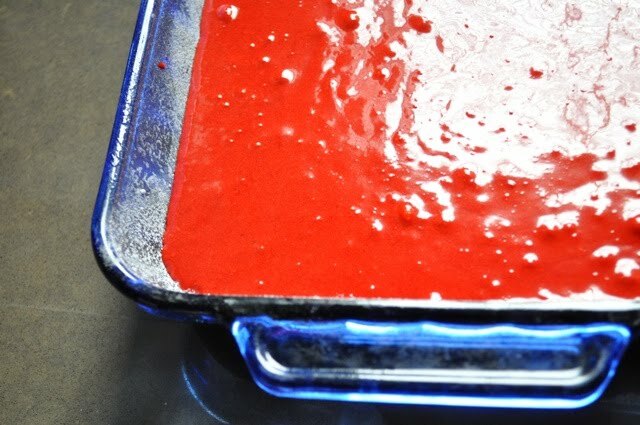 Note that if you use white or other colored melting candies, they do not melt as nicely or have the silky dippable consistency of dark chocolate. But I have heard adding a bit of shortening helps thin it out, but I haven't tried it myself. Once the chocolate is melted I like to remove my pot and bowl from the stove and let the chocolate cool down for about 5 minutes. But leave the bowl on top of the pot...you can place the pot on a potholder. This keeps the chocolate warm. During this 5 minutes you can prepare another cookie sheet (I like to use the half sheet pan size) by lining it with parchment paper. You can also assemble all your decorative toppings. I pour small amounts in little bowls so that not too much goes to waste. The next step is dipping and decorating. You need think about this BEFORE you start dipping your balls. If you want little sprinkles or jimmies you need to sprinkle them on just after the ball is dipped. If you want to use a colored melting candy to pipe on decorative designs then you would wait until the dipped balls are set up or dried. I did a little of both. Now to the dipping. Have a standard dinner fork ready and drop your cake ball into the melted chocolate. Gently toss the ball around in the chocolate with the fork until it is well coated. 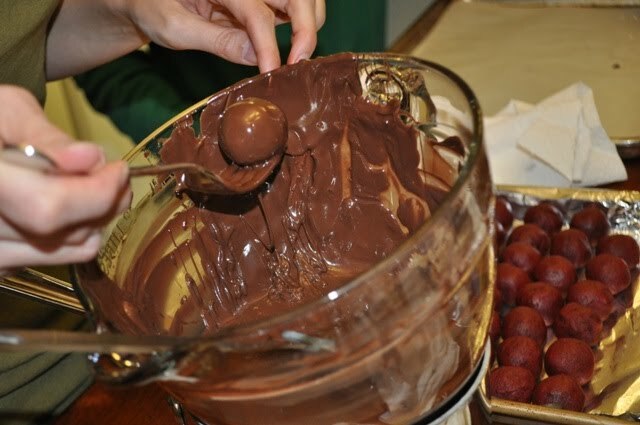 Then scoop up the chocolate covered ball with the fork and lightly tap, tap, tap it on the side of your bowl allowing some of the excess chocolate to drip off back into the bowl. When you are ready, hold the fork at a 45 degree angle pointing downward and carefully dump or roll the ball off your fork onto the parchment lined cookie sheet you prepared earlier. Do this slowly and be patient. You can coax the chocolate dipped ball off the fork by tapping it a little on the cookie sheet until it rolls off. 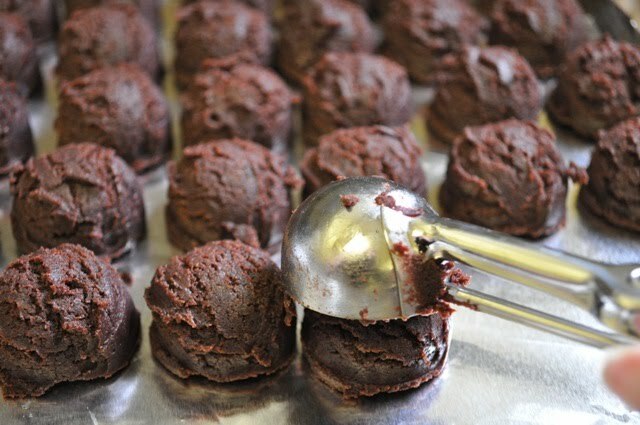 If your dough is too soft you may see "fork marks" in your cake truffle...don't worry! Keep a small rubber spatula nearby to smooth over any holes. 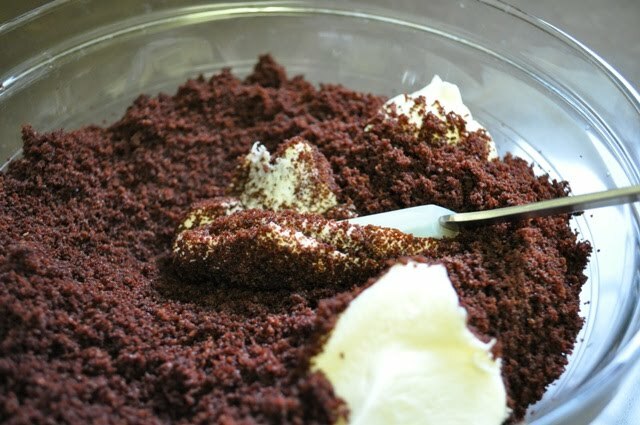 Your want your cake to be completely coated. Another trick I learned is to keep the sheet of balls in the freezer and just pull out about 6 at a time. 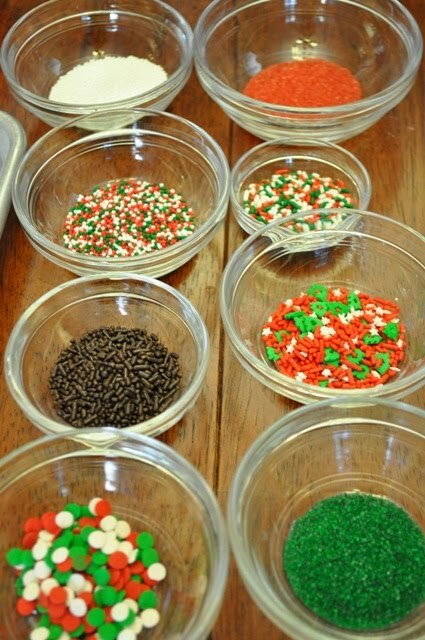 If you are using sprinkles you have to decorate each ball as it is placed on your cookie sheet. These babies dry incredibly fast so don't dilly dally! You can also decorate by piping on other colored candy melts or frosting. 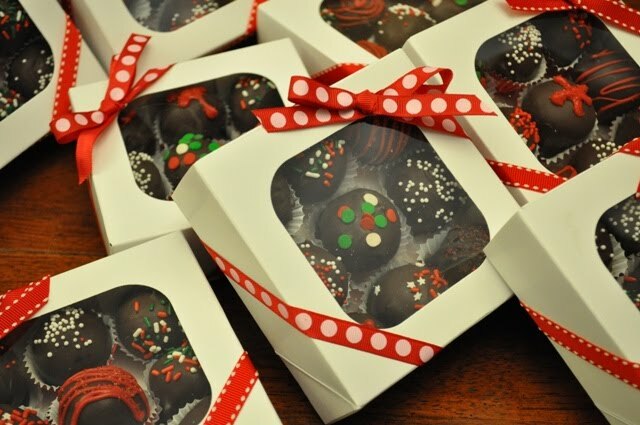 This type of decoration can and should be done after your chocolate dipped balls have dried. The decorating possibilities are endless! If you can, seek out a local cake decorating store. They will likely have a much greater selection of decorating goodies then a craft super store like Michaels. They carry things like pretty sanding sugars, lustre dust and sprinkles of all shapes, colors and sizes...super fun stuff!!! 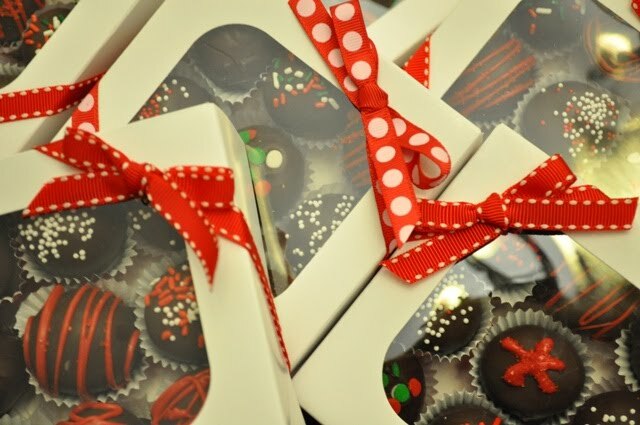 Next place your beautiful cake truffle creations in little candy cups and package them up. These cool boxes are made by Wilton and can be found at Michael's. 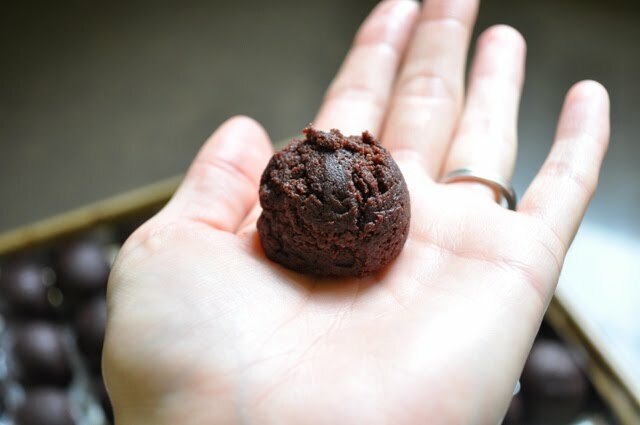 They hold 9 cake truffles perfectly and make for a nice presentation with the preview window. You want to show off all your hard work! Tie with a decorative ribbon and even put on a label and you have a wonderful homemade treat to share. Oh, my. These look wonderful and so beautifully wrapped! Awesome tutorial! And great idea for a delicious holiday gift. These are awesome. I just made this for thanksgiving so easy thanks to your wonderful tutorial and really super easy! I am thinking about holiday gifts :) Thanks very much! I can't wait to try make them this year. these look so cute, gloria. 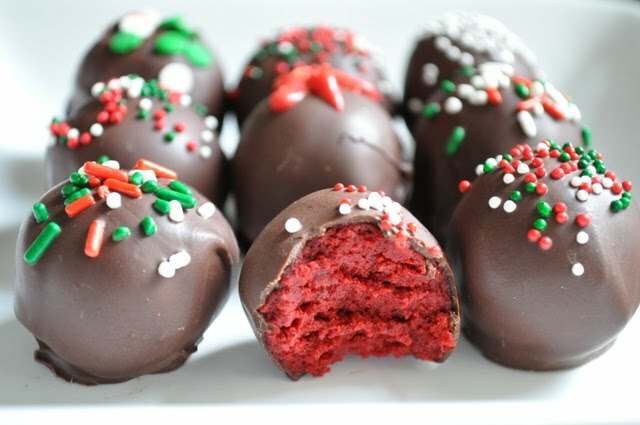 i was going to make cake pops and this is just like it without the pop stick...thanks for the great idea for christmas. I might make these.